HouseHomeCastle | It's not a house, it's a home. And a man's home is his castle. It's not a house, it's a home. And a man's home is his castle. Just quietly, our outdoor space is looking awesome! Even today, when we only had a high of 15C, it was just so lovely to sit outside in the sun and soak up all our hard work. We tore up the mouldy old bricks and sold them on. Garden maintenance is really the kind of work that is so much easier with friends. I’d only managed a few rows over two hours, but with the A-team, we had them up and on the curb by lunchtime. Clearing out the old to make way with the new. Thanks A-Team! After umming and aaahing over what look we were going for, we settled on Timberstone pavers from Amber. Beautiful Timberstone pavers from Amber, Fyshwick. The area was relatively flat and already had a base of paving sand so we were ready to go. We threw down a weed-mat, got out a string-line and got cracking. Everyone pitches in! Sweeping sand (and tip top tip: some bicarb to keep ants away) into the cracks. Done! The team looks exhausted! We’re adding lawn, furniture and a fence shortly, so more pictures to come. Total Cost: pavers $2559, ute borrowed from the best bro-law eva, labour paid for with food, tools seemed to turn up with the labourers, weed-mat about $20, wooden edging and pegs $25, extra sand borrowed from the bocce court. Also, a handy friends husband kindly cut some pavers in half with his circular saw for the cost of a 6-pack. Next step: the stepping stones of course. Cast your vote. Which do you think are best? 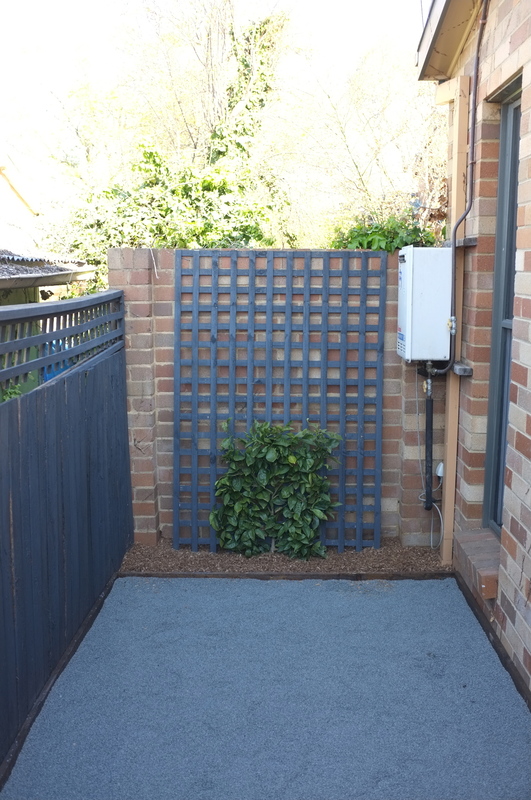 In moving to our beautiful, little home, we went from having a large backyard, with TWO dedicated veggie patches, composting corner, lawn, flower beds and paved entertaining area, to an outdoor space of less than a quarter of that. In order to get extra out of our gardens, we had to think critically. Most of the plants in our garden do double-duty. The screening trees along our property line are olive trees (fingers crossed one day they produce enough olives for us to do something fun with). We considered planting stone-fruittrees, however thanks to a humongous neighbourhood tree, afternoon sun is not an issue, and I didn’t like the bareness that would be our view in winter. Also, olive trees are perfectly suited to our Canberra clay soil, so much so, that some folk consider them a weed. The mod-pots in our ‘chill out zone’ provide fragrant herbs. The backdrop to our bocce court is an espaliered valencia orange tree which loves it’s hot brick wall. And an assortment of pots containing limes, a chinotto, blueberry plants, etc., fill in the rest of our plantings. But all this wasn’t enough for us. We’d gone from having about 9 square metres of veggie patch to basically a few pots. As well, I was starting to be quietly surprised by how much waste we produced. We’re not fans of throwing out leftovers, but even so, just the scraps from food prep was imense. And there’s only 2 of us! We’ve converted our front garden into a veggie plot. (I have grand plans for gradually morphing it into an Australian version of a classic english cottage garden. I can be very superficial and wonder why can’t a veggie plot look beautiful while being useful?). Over time, the patch will be hemmed in by lavender and lemongrass, with a side border of rosemary. I’d love to plant out a few natives too; I’m thinking fingerlimes (which I hear should do ok in Canberra – has anyone else tried them?) and pepper-berries flanking the front door. This is all well and good, but doesn’t solve our waste dilema. In all seriousness, I assume that food waste breaks down at the tip, just as it does in our garden, however wouldn’t it be nice to cut out the middle-man and improve our soil too? I’d heard about these “worm tube” things on the wonderful Pinterest (what did I do before pinterest??) and thought I’d give them a go. Worm-tubes are like a mini compost heap. Definitely for people living small-scale. Step 1: Get your gear. To my surprise, we already had a saw (I was about to head to my bro-laws place to borrow his, but woop woop, we have handy manly stuff, like drills and saws). 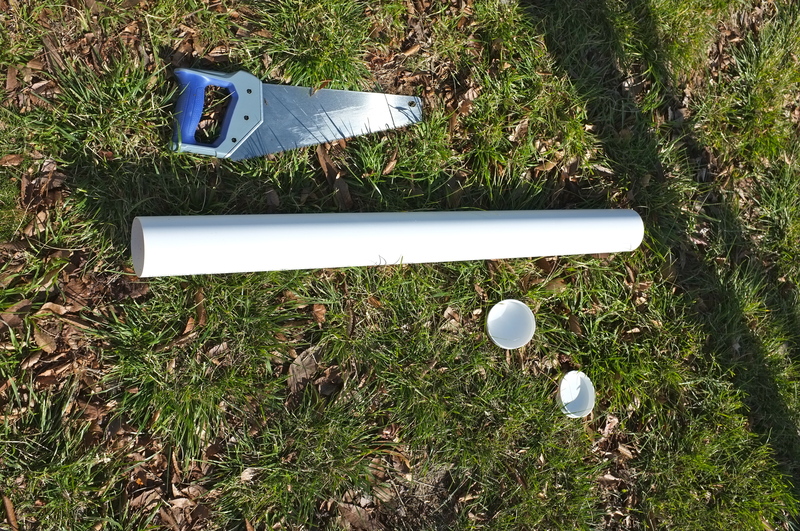 I bought a piece of PVC plumbing pipe and 2 caps. The pipe is about 20cm in diameter. As mentioned previosly, I can be a little impatient, so instead of waiting for my very manly, capable, strong husband to come home, I decided to saw the pipe in half by myself while bub slept in the car next to me. 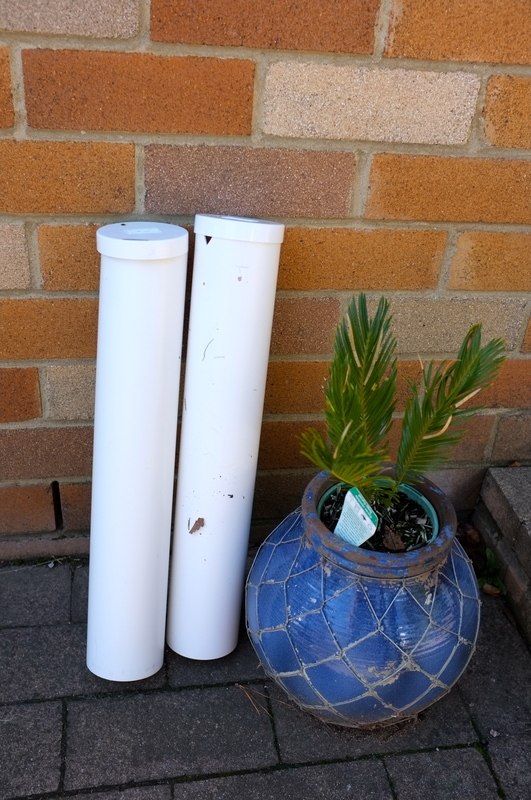 I felt so productive to have bought PVC AND saw it in half in one afternoon – small victories. Turns out I’m not as strong as a 6ft lumberjack. After 20 minutes of sawing I’d gotten 3/4s through and figured snapping the pipe would do the trick. If you’re not as superficial as me, it would. The snapping was devastatingly jagged. I put on my big girl pants and overcame the aesthetics. After all, most of the pipe is going to be in the ground. Also, bub awoke and demanded to be carried to a more comfortable location. Operation Worm Tube delayed til nap time. Our drill is a family heirloom, discovered by my grandfather, abandoned in a bag next to his car, and passed down to my dad and now to me. It’s one of those old-school ones that needs to be connected to the wall to work. For some reason the largest drill-bits don’t fit into the drill. Anywho, I installed the largest bit that would fit (size 7), and plugged the drill into the wall. Drilled a heap of holes and voila! worm tube done. Step 3: Be Dale and dig a hole. It’s really pretty simple. Buy pipe. Drill some holes. Dig a hole and bury the pipe in the ground. Then wait for the wormz to come. From here on, I save the kitchen scraps and stuff em in the tube and top it up with some rich soil. Dig bigger holes. A fair portion of the tube is sticking above ground in the final picture. 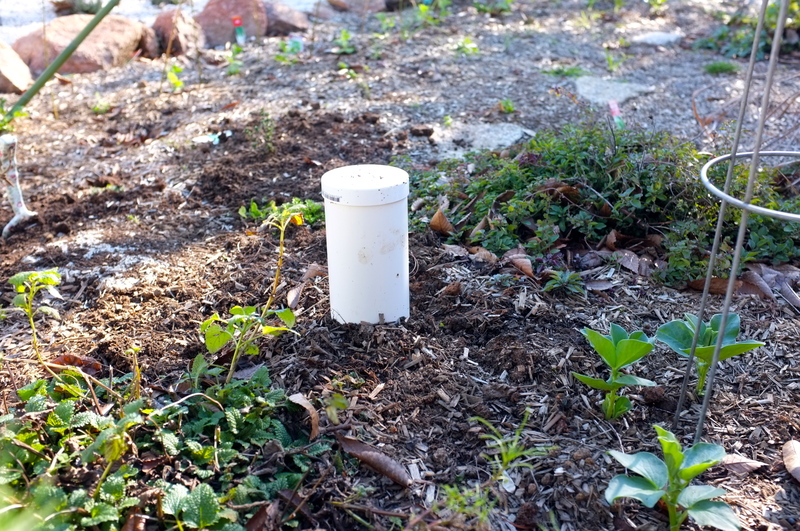 Now I dig deeper holes so that when I move the tube, all the scraps stay below the surface, away from rats and mice and other nasty scurrying nasties. Drill bigger holes. 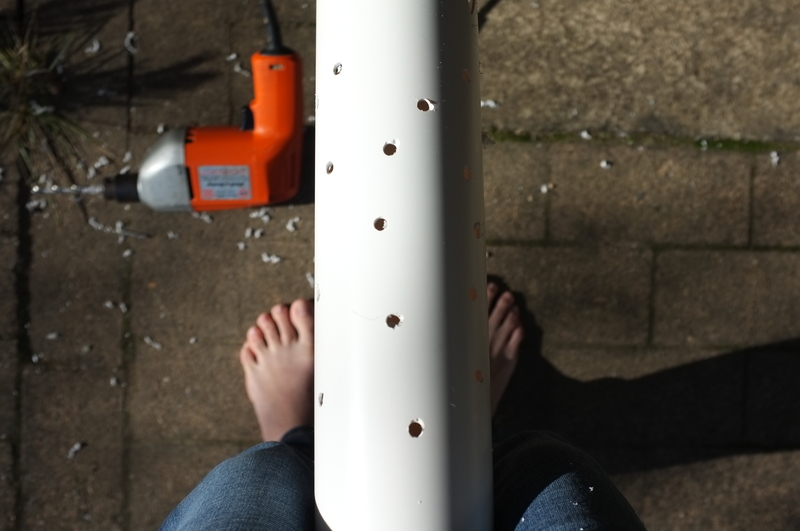 Once I figure out how to fit the big drill-bits into the drill I will make the holes bigger so that I can get nice fat worms into the tube. I’d also probably buy a few worms if I knew where to get them from. Ahoy hoy. It’s been awhile. To be honest, I’ve been a wee bit unmotivated since the arrival of little AB. So here’s a nice simple post to ease back into the blogosphere. 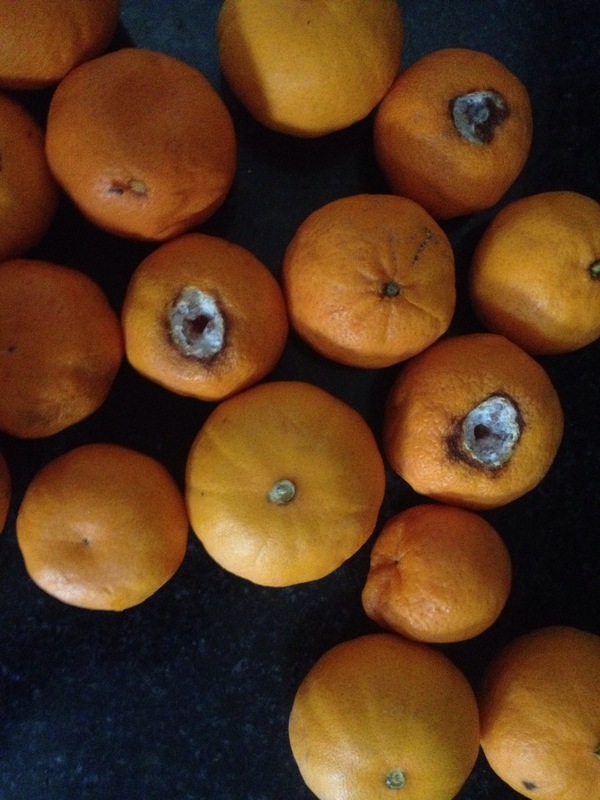 So what do you do when you have a glut of mandarins and Mr HouseHomeCastle doesn’t like mandarins? 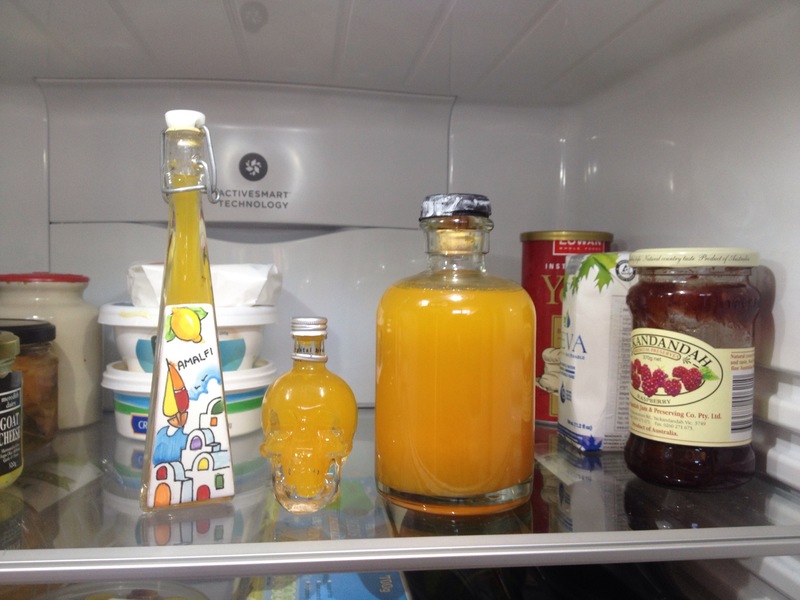 We make the easiest cordial ever. Juice all excess citrus fruit into a measuring glass. Strain through sieve into saucepan. Add about half as much sugar to saucepan. Rinse measuring cup with some boiling water. Add to saucepan. Boil till a slightly syrupy. Pour into strearilsed bottles. THE END. YOURE DONE. SIMPLE. We added the cordial to soda water. Really rather nice. Refreshing. A bit sweet but not overly. And easy to tailor. I used mandarins. The next go will be with grapefruit (YUM!!). Mr HouseHomeCastle doesn’t like all the seeds. Geez, mandys, what’s with all the seediness?? Urghmergod! So many mandys! And not looking too crash hot anymore. Mmmmm. Skull mandarin cordial. Or would you prefer amlfi cordial? 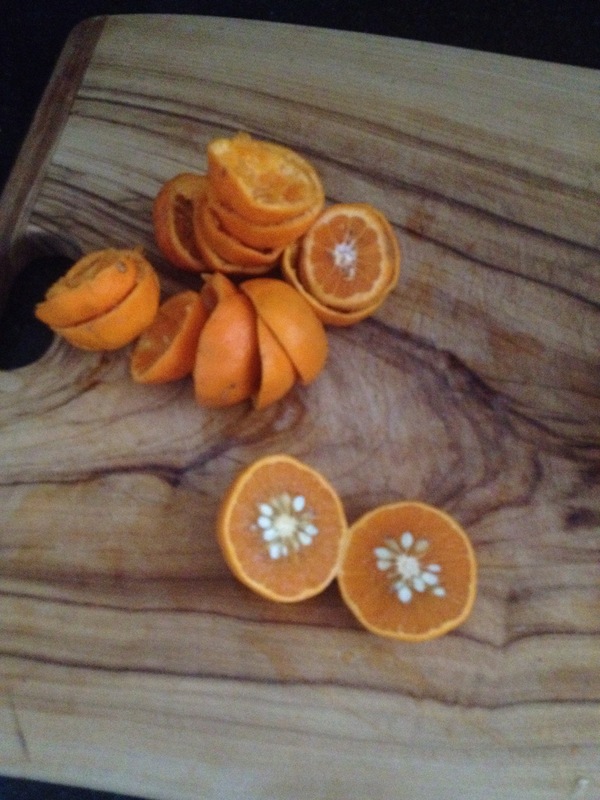 If you have a bunch of citrus halves leftover after this you can fill some with salt and use as an air fresher. The salt and peel absorb snellyness. I also add cloves. Coming back to the bloc blog party after a brief hiatus. Our house is now even more homely with the addition of our gorgeous little boy, AB. He’s kept us very busy, but we’ve just put him down at the delightfully early time of 6:30, and I feel awake enough to update this old draft post before heading to bed to read a few pages of my book (what luxury!). Couldn’t resist one proud parent photo. AB on day 2. This project is now a few months old, but I’ll post it anyway. It was a nice easy one for us to knock over in the warmer months and the simple process of painting everything WHITE made a nice update. We decided to start small, simple and with a room that wouldn’t matter too much if we stuffed it up. Our garage is a garage – it’s a 4m by 3m room with a cement floor and raw brick walls. We have a manual garage door (with a shiny new lock). This room will generally be our “Pool Room” (see: The Castle). It will house our prized possessions which have no real value (think overflow of books, boxes of old photos, foozball table, left over wedding decorations, flat soccer balls, spare beers, tools, dartboard, etc.). Garages are not designed to be lived in. However, as we plan to do a bit of living in here, and as The Can gets frrrreezing in winter, first things first was to make it feel a little livable. The garage already had a heap of shelves at one end – wopee! To brighten the space we (LS and bro-law JS) painted the walls white. Two coats. This made the world of difference. We also had some left-over blue-grey paint I’d been inspired to buy for a feature wall – that went on the back wall behind the shelving. Fancy! Yup – wearing thermals and a beanie – it’s cold! Obligatory photo needed for going back to Bunnings since I didn’t get enough. We added some off-cuts of old carpet donated from Team S (the in-laws) which helps keep the room a bit warmer. We have yet to mount the dartboard, but I think on warm summer nights, this room might get a bit of a workout and become “the Bar”. Total Cost: about $80 for two tins of plain all-purpose white paint, $15 for paint roller. Already had grey paint and extra paint brushes. Carpet donated. Next Project: Back out to the garden. This is really something that happened way back at the start of the journey, but I guess I’ve been so caught up in all the fun things (:|) that I forgot to mention the basics. Settling in involved heaps of cleaning. As mentioned previously, the elusive bro-law JS was a cleaning fiend, whrilwinding through our bathrooms and kitchen before moving in. Other fun tasks included changing all the locks (garage, doors, windows). Our ever-so-helpful real estate agent (see: eyeroll) didn’t manage to pass along all the keys to our place. Nor could she pass on information from the previous owners about the strata, but that’s a story for another day. I digress (and vent too much). Our locksmith was fabulous – nothing was a problem. Got a quote to us quicksmart and had everything in tip-top condition in no time. While we were on a roll, we got the central heating checked out (and learned it is not also central cooling – sad face). Appears to all be in order – check. Getting the heating folk out gave us some useful information about how old our system was, when it will need to be upgraded (and how much that will cost) and also the most efficient way to run the system. As a result, we’ve blocked up one vent that was too high (i.e., the heater was sucking in warm air at ceiling height, and thus the cold air at people-height was staying chilly). This has made a big difference to how efficient our home is heated and keeps us warmer and wealthier! Fixed a few small dings around the joint. We replaced a cracked toilet seat cover and now have a fancy schmancy soft-closing, slam-as-much-as-you-like toilet seat. Also replaced bung lights, filled-in holes in tiles, grouting, etc. A big job was simply finding manuals for all the appliances in the house. This was a really useful process for reading up on our newest friends – appliances (it seriously feels so luxurious to have a dishwasher, dryer in the house and instant hot water!). When searching for our Whirlpool dishwasher I found a lot of people listing a few potential issues with it if it doesn’t get the lines cleared regularly (flooding!). Also found reviews for the company that installed our heating system (needless to say, we won’t be using them in the future). Overall, this process was time-consuming. Finding recommended tradesmen to come out; taking time out from work to be at home (I can totally see the benefits of some of these futuristic tools! ); searching for no-longer-available appliance manuals, and waiting on hold to a heap of businesses. But on the whole, I feel it was definitely worth it. We now have a HOUSE folder that contains all our manuals, business cards for helpful tradies , and the overall satisfaction of know that things just work. What do you do with a glut of plums? We returned home from Yackandandah with a huge haul of plums. We also had a few extra thrown in from the lovely Linda over at From Little Things. So delicious! But we couldn’t eat them fast enough. To save ourselves from throwing any away, I jumped onto the trusty Taste.com.au and found plenty of recipes to trial. Enter two new never-before-attempted projects. Upside down cake and plum jam. The cake didn’t look particularly beautiful, but I promise it was totes delicious (it just needs an instagram filter to make it look good). Upside-down Cake. Looks a bit regular, tastes delicious! And rather easy to make too. Not sure what I did wrong – the top (which becomes the bottom) caved in. I can never remember – should I leave it in the oven to cool, or take it out right away? Anywho, it was all eaten that very night. To make the jam I first had to make a red wine syrup which filled the house with spicy christmas smells – cinnamon, peppercorn, star anise, cloves and wine. I’ve never made jam before, but this recipe was also very simple to follow. This is one of the first recipes that I’ve only had to cook for as long as the recipe called for. After 45 minutes on the stove I tested the jam was set by pouring a small spoonful onto a cold dish and placing it in the freezer for 1 minute. Then, running a finger through the jam it wrinkled and I knew it was done. Voila. I like being able to turn produce into something longer-term, like jams and sauces (next plum project: chinese plum sauce). I only knocked up half a batch with 1kg of plums which created 5 jars (2 jars already gone to good homes). It feels good to be able to share what we make with those around us. Or to say ‘thankyou’ to those that share with us. It didn’t take too long to make, and did not require too many skillz. Meanwhile, does anyone have any hot tips about de-stoning stone fruits? Halving the plums for the cake, and de-stoning them for the jam took me ages and created a huge mess. There’s got to be an easier way, no? ‘Boules’ is THE French game. Since it was created in 1907 in La Ciotat, in Provence, every single French generation has played it, from the hip youngsters on a sandy square sipping herbal tea to old men by the Seine river sipping red wine and complaining about the weather. We have a narrow strip of garden that runs behind our house. It’s in shade all morning and intense sun all afternoon. I wanted a lap pool (read: jacuzzi), but wiser minds prevailed. Our families love nothing more than a Sunday Session of bocce, so the husband and bro-law knocked up a frame which we in-filled with sand and road-base for a bocce court. It will be a great use of the space, practical, used a lot and not too expenny to put together. Pétanque, Boules, Lawn Bowls, Bocce… each are slightly different, but generally, the game is played in two teams, each player has two balls (boules) to throw, and the goal is to throw your boules as close as possible to the ‘cochonnet’ (the little ball that you aim at – literally “the piglet”). The winners are the ones who get their boules closest to the cochonnet. Strategy definitely comes into play – you can knock other people’s boules out of the way to make way for your teammates, or to block someone else. Also, if you play with a creative bunch, you might enjoy “Adventure Bocce” dreamed up by the bro-law, whereby the winner gets to set a rule. This can include standing on one leg, bouncing the boule off rocks, throwing the boules over a tree branch, etc. you are only limited by your imagination! Please do not try Adventure Bocce if you have nice boules! prepping the future Zone for Competitive Bocce, Canberra Chapter. A dark and crazy-sunny space. Cleared of ivy, foundation frame in. Not quite the 27.5 metres by 4 metres called for by the Fédération Internationale de Boules, but close enough. Pricking the weed mat with the hinky fork so water can drain away. Road base in. Frame stained. Fragrant orange tree espaliered along the back wall. Who’s up for a game? Have a cleanish rag handy. Have a separate pair of shoes at your front door – if you want to duck inside (oh, I don’t know, for a muffin, some water, a hat, to answer the phone, or your fourth trip to the loo), you will wipe down your hands on that rag you cleverly got out at the start of the project, then head inside, only to find extra paint on your wrist/ankle/big toe wind up on the door/floor/wall. It pays to be choosey about your wood – It maybe just be simple treated pine, but some planks had a beautiful grain which shows up magically once stained. Other planks were rather rough and somewhat detracting from the effect. If the tin says you need methylated spirits to clean up later, then turpentine won’t do the job. Neither will soap or steel wool. This stuff is a b!t©h to remove! Best to just try not get it on yourself or anything other than the wood. If you accidentally get any stain on bricks, you can wipe it off (quickly) with a wet rag. Keep one handy for those slip-ups. Rags – the swiss army knife of staining. Really, just keep a rag with you at all times. It’s probably easier to stain the wood before you install it – duh – that’s a my hot tip for next time. Project Cost: $100 for pine frame and the joining bits (braces?). $150 road-base and sand. Case of beer for the loan of the ute. Already had paintbrushes and wood stain. Special thanks goes to bro-law and his go-go-gadget arms, who held the trellis onto the roof of the car – one arm out each window – on the way back from the hardware shop. Project 6: Paving |… on Project 3: Bocce!